What I have seen when replacing the rings leaves me with an unanswered question, one that I could not foresee when removing the cylinder for refreshing. 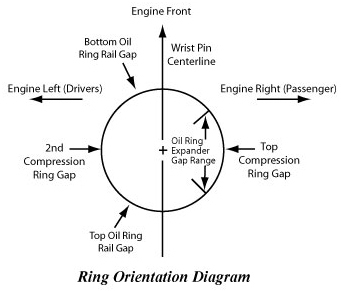 Given: new rings (3), with a three-piece oil ring; this gives five gaps to place equally around the periphery of the piston, with care to avoid placing a gap in the thrust face area (front of vertical cylinder, bottom of horizontal cylinder). Anyone got advice? Given the need to avoid placing a gap in the thrust face, I would then guess that I should crowd the five gaps around the remaining approximately 180-220 degrees of non-thrust face. Yes, I have googled and found many answers. All diagrams I have seen do not specifically show the thrust face in the diagrams, as is the case with the Deves Rings' instruction sheet that I purchased from you. The diagram you provided in this post is thus far like many I have seen, with the thrust line implicit on the front of the bore (facing forward). The bottom oil ring rail gap, however, still appears in the thrust face. I must be making a bigger deal out of this placement than is warranted, and will move on using that gap placement as shown in your drawing. That illustration Steve has provided is sort of confusing. It shows the piston pin center line as running fore/aft and if so that places the top and 2nd ring gaps on the thrust faces. That may be acceptable for an inline engine with a long piston skirt but it goes against all the recent illustrations I've seen. I've done plenty of rings and always have put the top and 2nd gaps about 45 deg. from the pin centerline and 180 deg. apart. The 3 piece oil rings usually have the upper and lower gaps also about 45 deg. on either side of the pin line and the expander gap on the other side of the piston, like 180 deg. from one of the oil rail gaps. You want to avoid lining up ring gaps with the ones directly above or below. In a perfect world the gaps would all stay in the same place when the engine runs but they never seem to stay put in actual use so all of this is kind of moot. Info exchanges such as this forum really help.